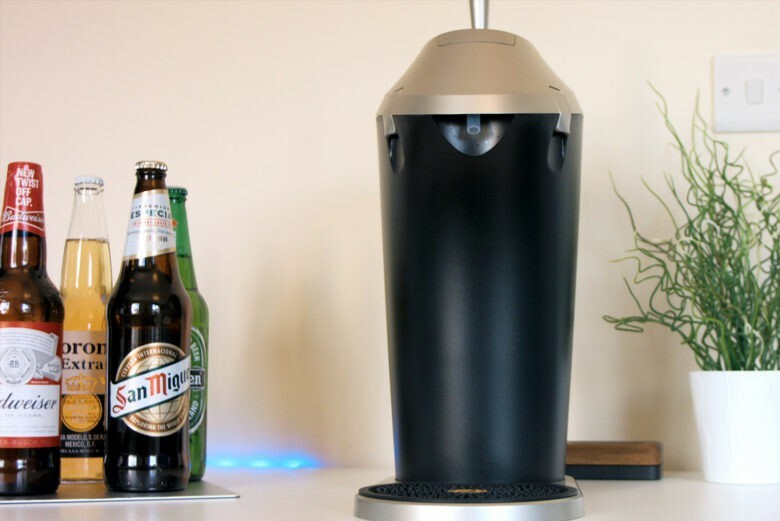 Mix technology and beer without worrying thanks to Fizzics. Technology and alcohol don’t usually mix. It normally results in lost iPhones or inebriated calls to an ex. But, I might make an exception for the Fizzics Draft Beer System. Fizzics is designed to enhance the flavor and aroma of any bottle, can or even 64 oz. growler you place inside. 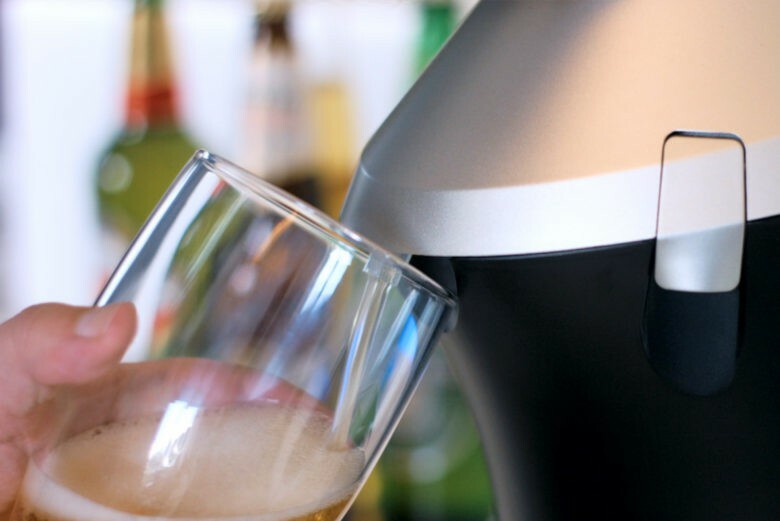 Without the use of any CO2 or nitrogen cartridges, the boozy contraption aims to give you the fresh from the tap experience by using sound technology. But, does it work? I gladly took on the challenge to try out the Fizzics and put it to the test. Check out the review below. As soon as the Fizzics arrived, I was excited. It’s not the usual product I receive to review, but it was an excellent excuse for having a few, nice pints. The draft system itself requires a little bit of assembly out of the box, but it was simple enough for even me to do. Place the canister onto the base, attach the handle to the top and place the beer mat into the bottom. The thing that took me by surprise was the lack of a power cord of any type. I already knew it didn’t use any gas cartridges, but I was expecting a plug of some sort. Instead, the Fizzics uses four standard AA batteries to power the magic that lies inside. Of course in hindsight, it’s a clever move. It makes it much more portable to take to parties, tailgates and the like. Once setup, it was time to try pulling my first pint. The lid is pressurized and kept in place with two clips on either side. This means that after I had placed my beer inside it will stay cold and fresh for up to 24 hours, or better still, 48 hours, if packed in ice. Once the bottle, can or growler is in the canister, the next step is to place the tube inside the vessel and to seal the lid back on top. After that, it’s just like pouring a pint from a pub tap: hold the glass at a 60-degree angle and pull the handle towards yourself. Where it gets interesting though is when the glass is three-quarters of the way full. To create the head with Fizzic’s micro-bubbles I then had to push the handle away from myself. It then uses sound wave oscillation to agitate the existing carbonation in the beer to create an aromatic and substantial foam head. If you’re cider lover — bad news: Fizzics advises you not to use any other type of beverage other than beer and water when rinsing the system out. I attempted an assortment of lagers to see what it accomplished for each. For my go-to tipple, Budweiser, it dampened a portion of the intensity and improved the malty notes. I also tried it with a couple of beers I’m not a fan of, for example, San Miguel. As a rule, the grainy flavor is excessively overwhelming for me, but after placing it in the Fizzics, it built up the sweetness of corn syrup and decreased the stronger flavors which typically make it unpleasant for me. I’m personally not a fan of ales, which meant I put off trying them in the Fizzics until the last minute. After placing one in nervously I found that the Fizzics had made the ale a lot smoother and more enjoyable to drink, although I’m not going to start drinking them regularly. The main issue I have with the Fizzics is when I’m using the smaller bottles. As I can’t see how much is left in the bottle, it’s hard to judge when to stop pouring and to start the head. On the off chance I depleted right to the base of the bottle, it results in the Fizzics spurting out beer and wrecking your perfect pint. Using the larger pint bottles though is a lot easier, filling the glass three-quarters of the way up and then creating the micro-bubbled head. Pouring the perfect pint is easy thanks to the Fizzics. To test that a placebo effect wasn’t taking place here, I decided to do a blind tasting test to see if I could actually notice a difference. I roped in a friend of mine to pour two of the same bottles while I left the room. The first straight from the bottle to the glass, the second from the Fizzics. When I re-entered, I gave both a quick taste. To his surprise (see the video), I almost immediately picked out which was straight from the bottle. This could be due to my extensive experience of Budweiser straight out of the bottle, but the one from the Fizzics was definitely better. Ninety percent of beer is consumed from cans and bottles, yet brewers intended beer to originate from straight from the tap. OK, so it’s not exactly the same as getting a pint straight from the tap at your most loved bar, but it’s damn close. For $150 it’s well-made and really enhances the taste and appearance of most beers. Is it an essential bit of kit, though? No, of course not. A majority of people will be content with their Budweiser in a bottle and their Coronas from a can. But it definitely improves the flavor with every last bit of it’s cutting-edge wizardry and would make a magnificent focus piece at your next party. Cult of Mac received review units for this review. Read Cult of Mac’s reviews policy.